Culms: Erect or rarely decumbent, glabrous. Blades: Flat, 4-16 inches long, 1/4 to 1/2 inch wide, glabrous or pubescent, conspicuous "W" constriction on blades; margins rough. Sheaths: Round, prominently veined, glabrous or soft-hairy, waxy. Inflorescences: Panicles, erect, 4-9 inches long, open or contracted, lowest branches whorled, terminal. Spikelets: Approximately 1 inch long, less than 1/4 inch wide, pointed, often drooping, 4-10-flowered; glumes unequal, papery, first glume 1-nerved, second glume usually 3-nerved; lemmas greenish to purplish, mostly without awns, longer than glumes. Habitat: Roadsides, pastures, hayfields, waterways, ditches, and waste areas, more abundant in highly fertile sandy loam or clay loam soils. Origin: Introduced from Eurasia into the U. S. in the 1880s, and now naturalized. Forage Value: Smooth brome is highly nutritious and palatable to livestock. It makes excellent hay and forage. Comments: Strongly rhizomatous. 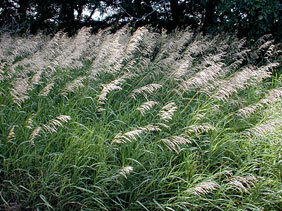 Smooth brome is widely planted for pasture grazing, hay, wildlife cover, and to prevent soil erosion. It frequently escapes into other habitats. The prominent W-shaped constriction on the leaf blades readily distinguishes smooth brome.